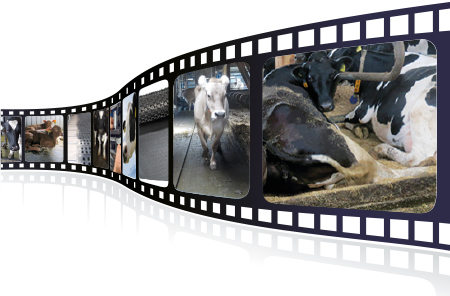 Watch our cubicle coverings, walkway and milking parlour floorings in practical use at various farms in many countries of the world. Here you can watch our cubicle coverings made of rubber in the field. Look and see how comfortable the dairy cows and young cattle feel on the flexible lying area coverings. Here you can watch how cows behave on walking area floorings made of rubber. Furhermore, watch how our rubber floorings are used in milking parlours and further areas in the dairy cow cubicle house. Learn how KRAIBURG slatted floor coverings are tailor-made so that they fit exactly for every slatted floor. Watch the rubber floorings in practice and how the cows behave on them. Watch in this video our systems for calving and separation pens in practical use - for better hygiene and safe standing for cow and calf.